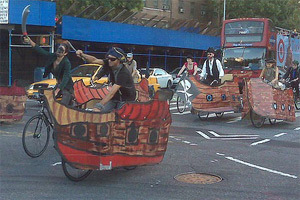 On Friday June 3rd, we will make our bicycle pirate ships at La Plaza Community Garden. Then on Saturday, the floatilla will launch for the Figment Festival on Governer's Island. 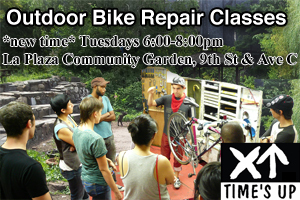 Bring your bike, ship building supplies and pirate costumes! We'll also have building supplies and costumes to share. Time's Up! was featured for a story on Univison on January 22nd, 2016. Check out the video here. 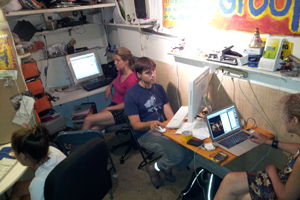 Special thanks to all our amazing (and bi-lingual) volunteers who helped out. And thanks to Univision for expanding Time's Up's message to an even greater audience. the streets screaming on the Halloween Critical Mass! Join Time's Up! on a stellar bike ride to the annual Urban Starfest in the Sheep Meadow of Central Park hosted by the Amateur Astronomers Association, in conjunction with the Urban Park Rangers. People's Climate March and Ride September 21st 2014! Time's Up! Environmental Organization has been working on sustainable solutions to combat climate change for 27 years. 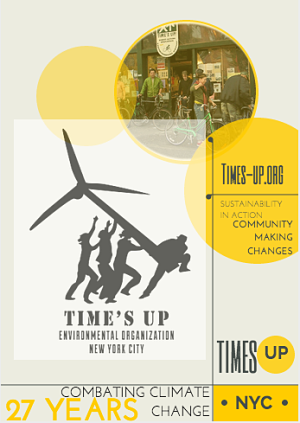 Time's up is an all-volunteer run Non-Profit group. We will be hosting and working with other community organizations to organize, support, and draw attention to successful sustainability efforts in NYC and to draw awareness to the Climate Change conference at the UN. 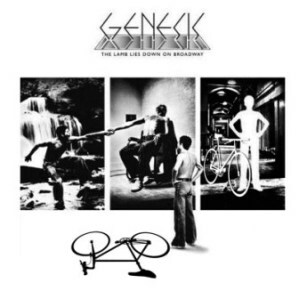 A bike ride based on the surreal NYC Peter Gabriel era Genesis album "The Lamb Lies Down on Broadway", during which we experience the good, bad and scary that make up our city streets! Tompkins Square Park, Manhattan (by big tree in the center of the park). 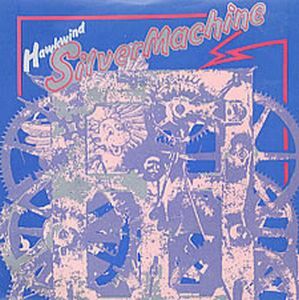 'Space Rock' pioneers Hawkwind (1972 composers of one of the first 'Steam Punk' rock songs about a bicycle) are touring the USA for the first time in nearly 20 years, so we want to have a pre-concert bike party welcoming event! Endless Summer! Bike ride to Rockaway Queens beaches. Bring swimsuit, towel, sunscreen, food and/or money for food, lock for bike, or leave your bike on the beach. Come prepared (tools, tubes, water, etc.) to ride some miles at a relaxed pace.